The US dollar was stronger on upbeat consumer data and on the back of an exodus of funds away from the euro and the yen. Markets were also bullish ahead of tomorrow’s retail sales figures. The benchmark US dollar index climbed 1.05% to 96.97 recovering losses from last week. Yields on short dated treasury bills fell back slightly. The greenback made significant inroads versus the yen, and the euro. 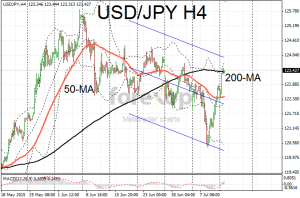 USD/JPY was trading back up towards 123.4. 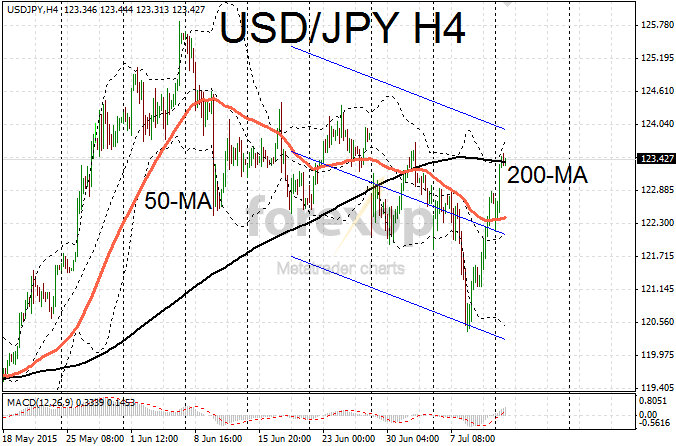 Frail sentiment on the Japanese currency allowed the dollar to push sharply higher reversing last week’s losses. USD/JPY is encountering resistance at the current level which coincides with the 200-point moving average on the four hour (H4) chart. It also coincides with the top of the downwards trend channel. A breakout above 123.74 would likely see a resumption of the previous upwards trend. USD/CAD extended its four-week long rally up towards 1.2790. Slack in the commodities sector is dampening sentiment for the Canadian currency. Stability in the price of oil is likely to help in the near term though the drivers continue to favor the greenback in the medium term. An early rally in cable quickly lost momentum taking GBP/USD back down to 1.5484. Support exists at 1.5472 while 1.5510 is a resistance level. The latest UK inflation data is due for release tomorrow. The headline consumer price index (CPI) is expected to fall to 0.1% in June. Also in the spotlight the governor of the Bank of England is scheduled to release a press statement on the latest inflation figures.